Lately I have been experimenting with end papers, the sheet that is pasted to the inside cover when binding books.Endpapers or endsheets serve a number of purposes, the most important being to help connect the cover to the signature block. It also covers the more substantial mull flap that actually does the job of securing the text to the cover. In some cases, the endpaper is used to mask side stitches or oozing glue. The secondary purpose of the endsheet is decorative. It is usually made of something other than the text paper. Handmade or painted papers are common. I tend to favor a more substantial sheet with stiffer properties. Thin papers present problems when pasting them onto the bookboard. They tend to tear more easily during assembly. In use, thin papers make for a weak hinge joint that will eventually fail. Since only two papers are needed per book, the additional expense of a better sheet is trivial. Even handmade papers are affordable for the purpose. You can even add color or designs using your inkjet printer. 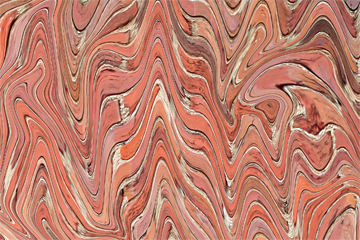 Marbled paper – A chunk of the real stuff. Ahh! But marbled paper! That’s the stuff! Fascinatingly beautiful marbled endsheets. Hand marbled papers are exclusive, that is, no two are exactly alike. Mastery of the technique takes time and patience, but the results are outstanding. 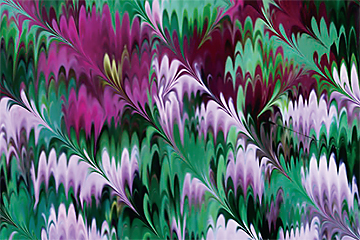 I Googled marbled paper images and studied them carefully. I saw basically two types, a more or less repeated pattern of loops, and a random swirly version that actually looks like real polished (stone) marble. I researched the process enough to develop an appreciation for the effort it takes. 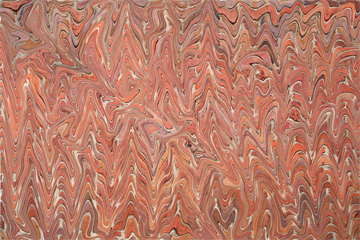 If you are really a rough ‘n ready do it yourselfer, you can try marbling your own paper. The process is time consuming, messy and a little spendy. But I’m an old printer, and my tendency is to look for a way to get the same effect digitally. I naturally tried to simulate the beautiful peacock’s tails and marble-like swirls on the computer. I am fairly adept at Adobe’s Photoshop and Illustrator. I thought surely I could come up with something that would work. My own Maharaji Paper! Made in Photoshop. “Work” was the magic word here. I tried starting with a pallet of colors sprayed in a sort of soft rainbow. None of Photoshop’s stock filters produced the desired effect. 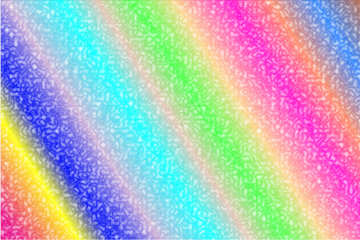 So I imported my rainbow to Illustrator and dinked with the tools I found there. I got some very interesting results, but nothing even came close to the marbled look I was striving for. Next, I tried making a series of hard-edged circles and shapes, and then applying the various filters and experimenting with the different drawing tools… with only marginally better results. Each time I tried, I developed a better appreciation for the the art form. It was easy to become discouraged. But then I tried working with photographs as a base. 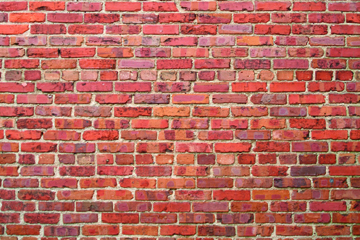 Using a picture of a brick wall, I used the liquify filter and a small size brush. By experimenting with the brush size, density and pressure, I was able to get the effect I was after. It takes a lot of time and patience to simulate marbling in Photoshop, as the “comb” used only has a single point, in contrast to the multi-toothed combs used by the true marbling artisan. This means you have to drag it multiple times in order to achieve the same results. I would painstakingly make a single stroke and possibly delete it and try again. Each time I liked the effect I would save it. In this way I finally fell into an acceptable rhythm of strokes and the process became easier. I was able to work the image to my satisfaction by taking my time. I came up with a pattern that reminded me of the old Checkmate TV series in the 50’s (for you old fogies out there). It looked like swirling liquid candy to an eight year old kid. I saved several versions, each with a different overall look. By manipulating the colors using the hue pallet in Photoshop, I was able to generate and save several different colored versions using the same basic pattern. 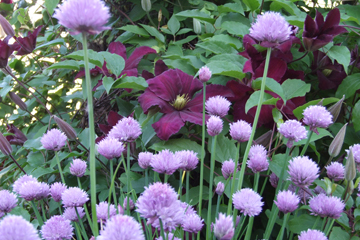 Original photo of Climatis and chives. I produced a number of interesting patterns using a combination of tools and effects in both Photoshop and Illustrator. Exactly how I did it makes no difference. The point is that with a little clicking around, you can generate your own patterns, using pictures, drawings or any number of colored shapes using a drawing or photo program on the computer. 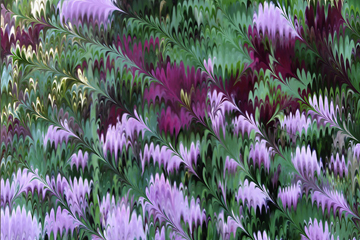 The next image I used was a photo of a purple climatis. Using the same tool, I tried to achieve the peacock swirls. To do this, I soon discovered that my strokes had to be more uniform and less random. It took significantly longer to produce this one and I was not as pleased with the effect. I would like to see someone develop a tool to be added to the liquify filter in Photoshop, one with several points to be dragged at time. This technique could be really interesting if it was applied to other colorful subjects such as an American flag or a circus clown. I had some of these patterns digitally reproduced on an ivory colored 100# Parchtex cover. I made full 12×18 images using these patterns so that I could make endpapers for any size book that I was likely to bind. I also did a job where I used one of these patterns on a gloss white stock with good results. One advantage of making your own patterns and printing them digitally is that you have full control of the scale and colors, making your options practically limitless. 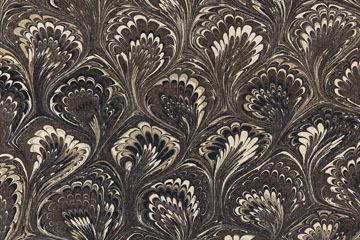 Do you know of a way to make interesting patterns for endpapers? I would welcome some advice on how to simulate real old fashioned marbled paper using digital tools. Show me your work. Let’s share some ideas. Make a comment. 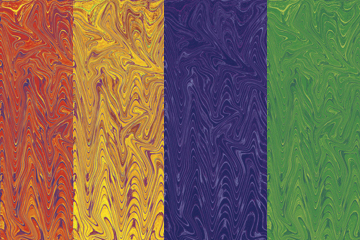 Four different colors generated from the same pattern. There is nothing that compares to a master at his/her craft. You are one cool dude. Everything you do with books is beautiful…just a reflection of the soul! Nice Blog – keep up the good work! Love this…do you use your own printer or have them printed? I make paste papers for end papers and covers. I currently outsource my printing to a Xerox iGen4, and print them in bulk. I find it is less expensive (and a lot less trouble) than printing them on my own. However, I sometimes will print just a few on my HP Photosmart 8550 for one-of-a-kind. I experiment a lot, and will try almost anything for special effects. I think hand coloring and staining is a gas! Every creation unique in itself. I’d like to see some of your work. Thanks for commenting and come back soon! Thanks for the excellent rundown! I’m thinking about making endsheets for my artists’ book. It’s About Time! It’s about What the Kid Did! DIY Bookbinding – Stitch or Glue?